Local brewers compete with foreign brands for a market already stretched thin by increased taxes and lack of availability. This was made just two days ago. It’s fresh,” said Masaru Hemmi, chief brewer of Japan’s Kirin Ichiban, pouring at the Moscow Beer Company’s factory in Mytishchi. The occasion was last month’s start of licensed local production of Ichiban. Both sides feel justified in pouring a few well-earned drinks. The Moscow Beer Company reckons it can sell Ichiban, which is one of the most popular beers in its home country, to Japanese restaurants and food enthusiasts. Ichiban is confident it has secured its foothold in the $20 billion Russian beer market. Despite the optimism, these are not easy times for Russian brewers. Over the past decade, the beer market surged by 40 percent, but then the global economic crisis, increased taxes on alcohol and saturation depressed the market by as much as 15 percent, causing the country to slip from third to fourth place worldwide for total consumption. Domestically produced beers, like cars, carry a certain amount of stigma. Even foreign brands produced under license are widely considered to be inferior to genuine imports. Specifically, this is linked to an alleged propensity to cause headaches. “Abroad, drinking a six-pack of Heineken is no problem. Here, two bottles will give me a headache,” complained one beer aficionado. One urban legend links the mysterious headaches to extra alcohol — or more sinister chemicals — added to popular brands to keep the population docile. However, there’s not much choice but to buy Russian. High import tariffs mean that imported beers make up just 0.5 percent of the market — compared with about 15 percent in the United States. In Russia, that segment is largely replaced by licensed domestic production. There are more than 40 foreign brands now produced locally — ranging from classic Czech lagers such as Pilsner Urquell (produced by SABMillerin Kaluga) to iconic Irish stout Guinness (produced by Heineken in St. Petersburg). The Moscow Beer Company has seven licenses on the books, including a 40-year contract to produce German Oettinger and a 25-year contract with Denmark’s Faxe, as well as its new deal with Kirin. The local beer market is a battlefield of giants, with little room for small independent breweries. Carlsberg Group, AB InBev, Efes Breweries International, Heineken and SABMiller together control more than 85 percent of the market. Baltika, which is the biggest brand and part of the Carlsberg Group, has a total brewing capacity of 5.2 million hectoliters [approximately 4.4 million U.S. beer barrels] per month. By comparison, The Moscow Beer Company, which started out as an importer of beers and soft drinks in 1994 and only began producing its own brews in 2008, turns out just 2.5 million hectoliters [approximately 2.1 million U.S. beer barrels] per year. Market analysts now say Brazil has displaced Russia from its place as the world’s third-largest beer maker, and Germany is snapping at Russia’s heels to move into fourth. So what went wrong? For a start, Russia is not really among the great beer-drinking nations. Even after the rapid growth in consumption over the past decade, Russians consume just 66 liters (about 139 U.S. pints) of beer annually per capita, according to estimates by Baltika. Czechs get through a staggering 151 liters (about 319 U.S. pints), while Germans drink 108 liters (about 228 U.S. pints) annually, according to a 2010 report by Carlsberg. Experts put the drop down to three factors: The market was probably saturated anyway; the financial crisis of 2008 ate into disposable incomes; and the government has drastically ratcheted up taxes on beer. 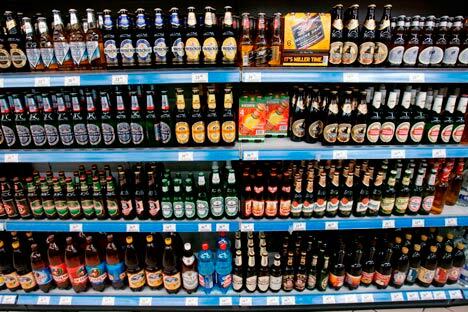 The beer excise went up 200 percent, from three rubles per liter to 9 rubles per liter, in January 2010. This year the tax is up to 11 rubles, and plans exist for further hikes. The real heavy hitters are the Russian brands — which account for the remaining 85 percent of the market. The biggest selling local brand (and the jewel in Carlsberg’s Russian crown) is the Baltika product line, which accounts for 40 percent of all beer sales in Russia.